During last week's storms and flooding, social media, Twitter specifically, was extensively used to disseminate information on sandbags distributions points, flooding hazards, evacuations, and shelters locations. While most elected officials wisely stepped aside and let the first responders do their work unimpeded, there was a role they could take to help spread vital information. That would be to take to Twitter and retweet valuable information to followers regarding safety dispatches to ensure as many people as possible are reached. 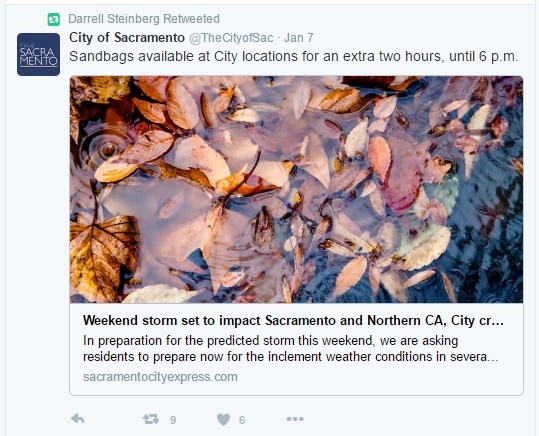 Last week Sacramento Mayor Darrell Steinberg retweeted valuable information to his 3,700-plus followers. Though Steinberg was not robust, perhaps he was tending to business for the City of Sacramento, he did send valuable information to his followers. As a side note, even former Elk Grove Mayor Gary Davis go into the act retweeting important information on the storms to his followers. 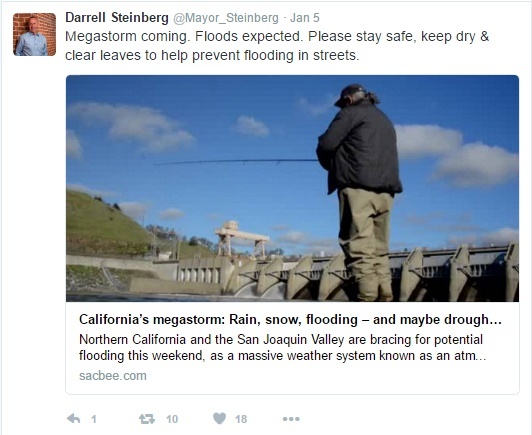 So what were Davis' protege, Elk Grove Mayor Steve Ly's messages on Twitter about as the City he is supposedly leading was preparing and reacting to the storm and flooding? Did he help get word out to as many people as possible using his position as Mayor about sandbag distribution points, evacuations centers, flood hazards or road closures, or was he focused on something different? For people who has observed Ly's behavior as an elected official, his focus is not on the constituents he serves, rather it is one his own personal activities. Below are tweets from the Mayor during the last week of storms and flooding. As you will see, instead of using his platform to distribute important information to constituents, his tweets, per usual, were centered on personal glorification. As was said to the Ly by an Elk Grove Citizen at last Wednesday night's City Council meeting, "it's up for you to stay home Mr. Mayor, and take care of Elk Grove business and not spend time with your personal political agenda." See Ly's Twitter activity last week below.